If God exists, how does God look? There may never be an answer to this question, but if one had to guess, God must look like music. And if God looks like music, God’s angels must look like whirling dervishes. If music connects you with the divine, Sufi music lives for the sake of the divine. In praise of the divine, one with the divine, Sufi verses, as if, resurrect a lifeless soul. Sufi music is the ‘form’ in which ‘the formless’ seems to manifest effortlessly. The singing of a Sufi singer washes over the soul, soothes every wound and makes you whole again. If her voice carries an ode to the divine, her eyes bear a glimpse of the divinity. This singer rouses fervent devotion and passion with her songs because she doesn’t just sing the verses, she feels and lives them. This true passion of a Sufi singer comes alive in the voice of Harshdeep Kaur, fondly known as ‘Sufi ki Sultana’. In an exclusive conversation with Soulveda, the vibrant, turban-clad artiste talks about her connection with music, the divine in every note, and the gratitude that fills her heart as she goes about her life armed with the magic of music. Your interaction with music began at age six. How does such exposure impact an artiste’s journey? Things that you learn at an early age always stay with you. I started learning Indian classical music when I was six. I’m deeply thankful to my parents who recognised my talent and encouraged me to take formal training in music. My training helped me become what I am today. You inherited music from your father. How did it influence the parent-child relationship between you two? My father and I share a very special bond. I’m his little princess. I have always seen him working hard towards making my dreams come true. But at the same time, he has always taught me to lead a normal life. He made sure I completed my education, went to college and enjoyed regular college life like any other girl would have. Sufi music has been the foundation of your musical journey. How did your initial interaction with Sufi music begin? My first introduction to Sufi music was through Gurbani. My mom used to recite Shabads to me when I was little. During my teens, I started listening to a lot of music by Ustad Nusrat Fateh Ali Khan, Reshma, Abida Parveen, and Wadali Brothers. I immediately fell in love with the mystical quality of the songs they sang. Sufism is one of the purest connections with the divine. What has this connection done for you as an artiste? I feel God is everywhere, in every particle, and music is the best way to connect to God. Whenever I sing Sufi kalaams I feel a certain connection with the almighty. Listening to a lot of spiritual music has also made me calm. You start seeing the positive in every situation. It has also taught me to be grateful for everything. I have learnt that to be a good artiste you also need to be a good human being. The goodness of the soul reflects in the voice. 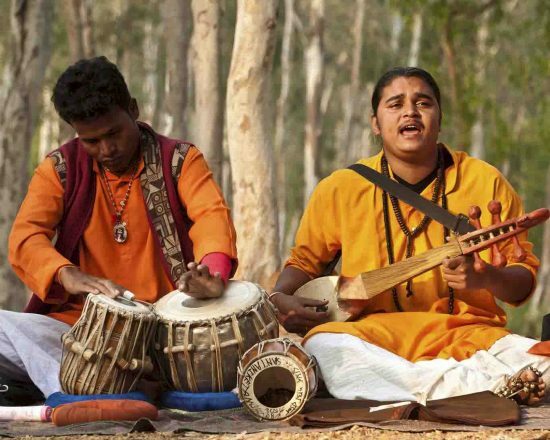 Do you believe artistes rooted in deep traditions and heritage need to adapt to a changed musical universe today? Our traditions and heritage are precious! There are artistes who have dedicated their whole life in preserving them and taking them forward to the next generation. Today, the ‘sound’ of their music might be changing but the ‘soul’ will always reflect the richness of their art. The world of music and artistes has so much to offer. As an artiste, what are your lessons from it? I have grown up listening to artistes like Jagjit Singh, Reshma, Lata Ji, Asha ji. When I look at their journey, it inspires me to excel in my art. I have learnt that to be a good artiste you also need to be a good human being. The goodness of the soul reflects in the voice. Also, being my own critic helps me improve my art. How has the role of an artiste changed over time? What responsibility does an artiste carry to nurture art and culture? I feel, as an artiste, it is my responsibility to use my music as a tool for social change. Music has the power to connect, it has the power to heal. I’ve been associated with social causes like ‘Save the Girl Child’, ‘Girl Education’, ‘Clean Environment (Hawa Badlo)’, and others. I continue to support such causes through social anthems and live performances. Tell us about your collaboration with an initiative like Fakiri. What brings about this artistic relationship? Fakiri Festival is a great initiative to bring forward folk and Sufi music for music lovers across generations. It will help rediscover our traditional roots. I’m happy to be associated with this festival. It’ll be a beautiful stage to sing my favourite songs for the audience. Harshdeep Kaur is an Indian Sufi and playback singer who has worked with some of the most renowned music composers such as AR Rahman, Amit Trivedi and Pritam Chakraborty. As much as she is famous for her Bollywood songs, she is also known for her soulful Sufi renditions. At a singing competition, Kaur was given the title of ‘Sufi Ki Sultana’ by actor Amitabh Bachchan. 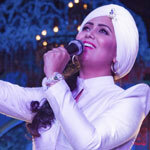 While performing Sufi songs, Kaur usually wears a turban as a mark of respect, which has become part of her identity. Just a beautiful expression of music, and it’s connectivity with life, soul, tranquility and ultimate joys of life. Very good expression about music and it’s connectivity with life. Thank you all for your lovely words.